The Hebrew word for "saw", literally means a "vision," but often signifies a "prophecy." This word, as it stands in this verse, unquestionably denotes that there is nothing in this book which was not made known to Isaiah himself. We learn from this word that the prophets did not speak on their own accord, but were enlightened by God, to see those things which they themselves would not have otherwise been able to understand. All throughout Biblical history, it's been documented, God had sent his prophets to deliver His divine messages to people, or to the nations that He was wanting to reach at a particular time. God would send His prophets out, to warn people about their sinful and wicked ways, along with prophesying possible divine judgments, they may be facing in the near and long term future, because of their evil actions. These same prophets were also used to help, guide, and encourage some of God's chosen vessels. Throughout history people try to label or link prophets to fortune tellers. This would be completely off the mark, and very dangerous for those, who are trying to place this title, or stigma, on God's personal servant and spokesperson. Prophets are God fearing people, in which God has chosen to be His personal servant. A person that has been designated to deliver His divine messages to individuals and the world. These are messages that give warnings to sinners, as they urge them to repent from their sinful and wicked ways. These messages can also come through some type of vision, or dream interpretations. But a prophecy isn't always bad, being that it could carry good news, that speaks about great blessings, or some type of deliverance that's to come, for a particular faithful person or nation. Now as we go through our Bibles, study them, we learn that biblical prophets are documented from within three primary categories: Major, Minor and Oral. In regard to the terms major and minor? Know that these are titles that have been placed on the majority of these prophets. The title in which a prophet gets, is based off the size of their documented writings. Keep in mind, this does not mean that these prophets that are label "minor" has any less authority, than the prophets that are label "major." I believe that these minor prophets, did just as much work, as the major ones. I'm pretty sure that they did just as much preaching, and serving the Lord as any other. So they shouldn't be penalize with a title that may suggest other wise. Now when it comes to the biblical oral prophets, Elijah and Elisha. Know that between them, they don't have any written books to their credit. But I would not even dare to think, they were "minor" in any way. This is why I will try to write about every Biblical prophet that I come across. Automatically stay updated on what's going with this site, as I add articles on different prophets, that are documented within the Bible. RSS FEED TOOL : This option will help keep you updated on all the latest pages from "Christian Resources Today." This tool is located at the bottom of the Navigation Menu over to your left. SHARE THIS PAGE TOOL : This option is for those that like to use Social Networks like Facebook or MySpace. This site tool is located at the very bottom of every page. PAY IT FORWARD TOOL : This is another site tool feature that will allow you to share a specific page that's located on this website. You can do this by using a special HTML CODE (that we provide you with) which is specific to that one particular page. This will allow you to share that particular page on your blog, a Web page, forums, your Social Networking account, or anywhere else that someone would find this page to be a blessing. This link is also located at the very bottom of every page. "I have done this with a clear conscience and clean hands," Abimelech would tell the Lord. "Yes I know you did this with a clear conscience, and so I have kept you from sinning against me. That is why I didn't let you touch her. Now return Abraham's wife, for he is a prophet, and he will pray for you and you will live. But if you do not return her, you may be sure that you and all yours will die," the Lord would warn and instruct the king. Agabus was one of the prophets who came down from Judea to bring Paul the Apostle a message. While taking Paul's belt, he tied his own feet and hands and said that "The Holy Spirit says, 'In this way the Jews of Jerusalem will bind the owner of this belt and will hand him over to the Gentiles.'" So what happen to Paul? 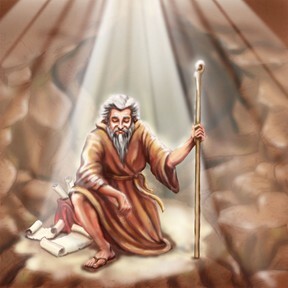 One day while Jeroboam was going out of Jerusalem, he was met by Ahijah the prophet of Shiloh. This is when Ahijah delivered the message on how God was going to tear the kingdom away from king Solomon, leaving him only with one. But now God used Ahijah to tell Jeroboam that he would be getting the other ten tribes. Deborah the Prophetess had inspired Barak to go and defeat Sisera. Sisera was the commander of a Canaannitish army which was called Jabin's army (Judges 4:4-5). Note: There were only two people who held the position of a judge that were also called prophets. She was one and Samuel was the other. The account of Elijah also includes the accounts of king Ahab and his wife Jezebel. The interaction between the three makes it almost impossible to separate the accounts. The thing that stands out immediately about the Prophet Elijah is that he comes on the scene in the Bible, from out of no where and immediately becomes a problem for king Ahab and his wife Jezebel. The ministry of this exciting prophet starts right where Prophet Elijah ministry had ended. Prophet Elisha found himself in a rare position to be able to have the divine mantle that God place on Prophet Elijah to be passed on to him. This cloak was Elijah's mantle which symbolizes preeminence and authority for the prophet's earthly ministry. Now this same cloak would be passed on to his most dedicated student, Elisha. This was a confirmation that he would now officially become Elijah's successor. Here we have a record of perhaps the first recorded prophet in the Bible. Enoch who name means "dedication" recorded account begins at Genesis 5:18-24. Lets explore a little bit about the Prophet Hosea who is believed to be the first of all the writing prophets. It is also believed that he was raised up a bit before the time of Isaiah. Huldah was the wife of Shallum, who both lived in Jerusalem in the Second District. She prophesied about the destruction of Jerusalem. Which did come to pass when they were taken and put in captivity by Babylon. Did Isaiah Have A Wife? Unfortunately there wasn't a prophet present that could step forward and represent the one true God. But Ahab knew of one that he hated, and he went by the name Micaiah. So the Israel king had sent one of his officials to bring this prophet to him at once. There's not much that we know about this prophet of God. But what we do know is that Ahab hated and despised him, because he never had any good prophesies that the Israel king wanted to hear. Miriam was the first female prophet that was mention in Bible. She was the sister to Moses and Aaron. She would probably be best known for the jealousy she displayed towards Moses and his wife, in which she was punished by God with the disease of leprosy. God saw that Noah had enough good qualities within him, to where God decided to turn Noah into a seed for all of humanity to be saved through at that time. Make sure you get that? It was at that time when God had decided that He was going to destroy humanity. But instead, He decided to save humanity through the seed of Noah at that time. After Rehoboam made it back to the city of Jerusalem, he was determined to gain back control over the ten tribes. So he assembled the "House of David" and raised an army of one- hundred and eighty-thousand men. Rehoboam was ready to wage war against the "House of Israel" but God had different plans. The Lord sent a prophet by the name of Shemaiah to go and speak to the Rehoboam and the entire House of David. Once Shemaiah came before the people, he spoke these words: "You shall not go up nor fight against your brethren the children of Israel. Let every man return to his house, for this thing is from Me." These four young women were the daughters of Philip the deacon. Philip was one of the first seven deacons that were chosen by the early church to wait and serve tables. He later was promoted to an evangelist and went to the city of Samaria, where he became a great soul winner. As for his daughters, they were mentioned when Paul the Apostle had visited and stay with Philip while he was in Caesarea. It's at this point the Bible mentions (Acts 21:9) that Philip four daughters were prophetesses. Now this prophesy that was given by this prophet of Judah was very powerful? For it did not just state the events that were to follow behind Jeroboams actions, but it actually named the name of the man that was going to do it, 300 years before he was born.